Mapconception is an on-going collaboration between Arzu Arda Kosar and Deb Diehl, who share a fascination with the historical cartography of Los Angeles County. 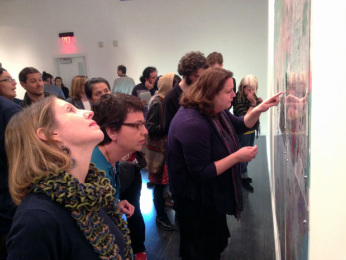 We're interested in the ways psychological perceptions influence the practice of mapping, and how it continues to shape ideas of ownership and belonging in communities. Now in the first phase of the project, we're making and exhibiting several maps where viewers are invited to participate. 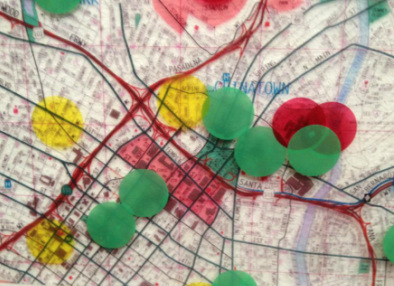 Each map encourages a particular historical or psychological examination of LA county, and allows viewers to record their ideas and relationship to it. The second stage of the project will incorporate a series of videos, shot at the boundaries of former Spanish and Mexican era Ranchos, and the third includes an on-line interactive psychogeographical map. Background Layer: Thomas Guide maps of currently Los Angeles County and city boundaries. Layer 3: Boundaries for five of the first land grants established in 1784. Topmost Layer: Interactive layer where members of the South Bay were invited to demarcate where they live. 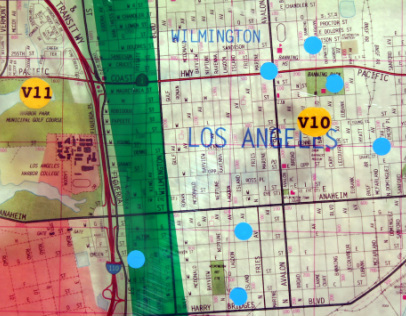 We intend to continue creating of maps with the help of community residents from each region of LA County. If your school or organization is interested in hosting or participating in the project, please contact us!